Scientists at the University of Malaya have designed a roof that can help address an environmental conflict: increasing demands for energy to increase living comfort versus a need to scale back fossil fuel use to address climate change. The conflict has driven interest in more efficient renewable energy sources, especially in emerging economies. The roof's most visible feature is a V-shaped structure set atop a peaked roof, which guides wind into a series of turbines situated below it to generate energy as they turn. The structure also increases airflow within the building by means of vents built into the peaked roof to enhance natural ventilation. 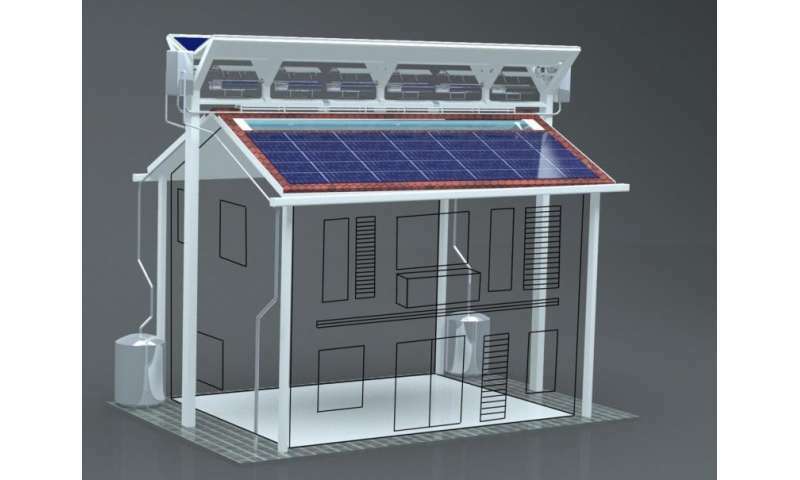 In addition, a rainwater harvester is connected to an automated cooling and cleaning system that washes solar cells embedded in the sloped roof to keep them efficient. Transparent skylights brighten the main rooms inside the building during the daytime, reducing the need for artificial lighting. The team says that adding the roof to an existing building creates minimal visual impact and can be used in urban and rural settings. In Malaysia, the average person uses about 4,200 kilowatt hours (kWh) of energy per year. The researchers say their roof could support about six people by generating more than 21,200 kWh of energy a year while saving another 1,840 kWh because of its skylights. Also, the venting system could move about 217 million cubic metres of air and reduce carbon dioxide emissions by 17,768 kilos, while the rainwater harvester could collect close to 525 cubic metres of water. The team says the roof's energy yield depends on where it is located. The researchers note that there were low winds at their test location, so payback could be greater in windier areas. They say the eco-roof can be situated and adjusted for local sunlight, rainfall and wind direction, using regional weather data. The technology is here and it works. We are farther along in knowledge and capability than many know. Zero-energy houses are not just possible, but practical. All we need now is the will to change and to act.